Let me clarify one thing first. The title should read '...but Show a Very Low Level of Activity'. I like this case study as it reflects well one of the most common questions our clients and other event participants ask us: we would like to leverage twitter, so should we launch one main corporate account to do everything? Or should we launch several accounts to cover specific geographical areas, market segments, or applications like media relations or customer care? 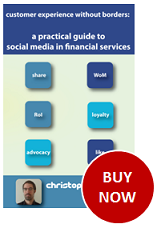 Since March 2009, my team have been tracking and benchmarking how theglobal financial services industry is using social media to engage with theircustomers and their markets. We now track over 1,700 twitter accounts in78 countries. The levels of activity, engagement and 'success' vary tremendously from oneregion to the other. The EMEA region is still lagging behind North America,and it doesn't seem as keen to engage in conversations as the more and more active LATAM and APAC regions. So which countries are leading the twitter revolution in Asia Pacific? I invite you to check out our video Top10. So which countries are leading the way on twitter in Latin America? I invite you to check out our video Top10. The levels of activity, engagement and 'success' vary tremendously from one region to the other. The EMEA region is still lagging behind North America, and it doesn't seem as keen to engage in conversations as the more and more active LATAM and APAC regions. This is my latest video update on our popular Visible Banking Twitter Watch series, the most comprehensive benchmark of the worldwide financial services industry on twitter. My team are now tracking over 1,680 accounts in 75 countries. 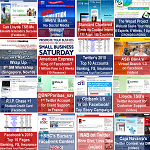 This month, I've asked my team to start tracking financial institutions on Google +. Google + was launched on 28 June 2011, and in the last four months, everything has been said of Google's latest venture in the world of social media. This is the fastest growing 'social network' ever with 40 million 'users' (vs 'active users') at the end of October 2011. Google+ Proclaimed Dead. Is This a Fair Assessment? ', '5 Reasons Google+ Could Win the Social Enterprise Battle'. A couple of weeks ago, on 7th November, Google launched 'Google+ Pages' for brands and other businesses 'a la facebook pages'. In just a week, it has been claimed that over 60% of world's top brands created a Google+ page. With this move, the search engine giant is poised to reach 60 million users by year end. So how big is the opportunity for brands and how critical it is to build an active presence on this other social media 'channel'? More importantly, should financial institutions hurriedly jump on the bandwagon and create another social media profile without much conviction or engagement? In the new few days, I will share with you some of our latest unique insights on facebook and twitter via a number of video posts. I've already confirmed that only 0.05% twitter accounts in financial services are verified which seems low from an industry whose reputation has been severly damaged in the last three years and which is eager to improve brand perception and provide better customer care wherever their clients are. I will also talk you through one of the key challenges on facebook for financial institutions: driving engagement via an open wall. Surprisingly, we found that the majority of facebook pages in financial services are 'open' and 'at risk'... Stay tuned on Visible Banking! I am delighted to announce that, as of 1st October 2011, my team was tracking a cumulative 2,738,148 followers from 1,560 twitter accounts in 72 countries (source: the Visible Banking Twitter Watch series). My Visible Banking Team has started tracking and benchmarking how financial institutions are using social media channels like facebook or twitter since March 2009. I am delighted to announce that we are now tracking over 1,000 pages and apps on facebook, and over 1,500 accounts on twitter, in 75 countries. In the new few days, I will share some of your latest unique insights on facebook and twitter via a few video posts. I will also confirm that the financial services industry hasn't started to really use twitter yet (90% of the accounts being 'inactive') and the majority of facebook pages are 'open' and 'at risk'. Stay tuned on Visible Banking. As of 1st August 2011, my team was tracking a cumulative 2,347,047 followers from over 1,560 twitter accounts in 72 countries. The first 'brand' is CNN, #24 on the list with over 4.7 million followers. The first page in our benchmark, @AmericanExpress (with 156k followers) wouldn't even make the Top 1000 (>400k followers). I believe the financial services industry worldwide was lacking a comprehensive benchmark of social media activities on more and more popular online communities like facebook or twitter. This is precisely why back in early 2009 me and my team at Visible Banking started tracking the social media presence of banks, insurance, investment firms and more widely financial services firms all over the world. We are currently tracking over 1k pages and apps on facebook and over 1,550 accounts on twitter. Please find below some of our latest insights for the month of July (data collected on 1st August). I invite you to watch my short video where I talk you through the latest news, stats, and additions to our benchmark. Companies mentioned: American Express, Banesco, SCB, Kasikornbank, BBVA, PIMCO, Santander, BNI, Bank of America, State Farm, Charles Schwab, Wells Fargo, VPI , Fidelity, Citi. I invite you to check out our Top 10s for the insurance industry, the credit union industry as well as the following countries and regions: France, UK, Spain, Asia Pacific (APAC), Latin America (LATAM). Please note that those Top 10s are available exclusively on our facebook page.